Wedding Sherwani Outfits- Sherwani is one of the wedding day essentials for any guy who belongs to the subcontinent region particularly. Indian and Pakistani grooms style themselves up in these charming sherwani outfits which are both festive and classy at the same time. Many designers in Pakistan and India have been known for their exceptional sherwani designs and styles. 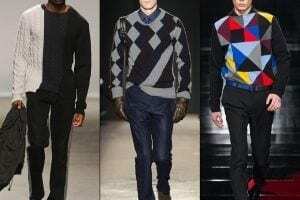 Nowadays designers are pairing up these elegant outfits with beautiful pants and trousers that are unique in their on way. Sherwani outfits are being designed in both bright and monotone shades. Materials like karandi, silk or jamawar are used to create amazing amalgams. 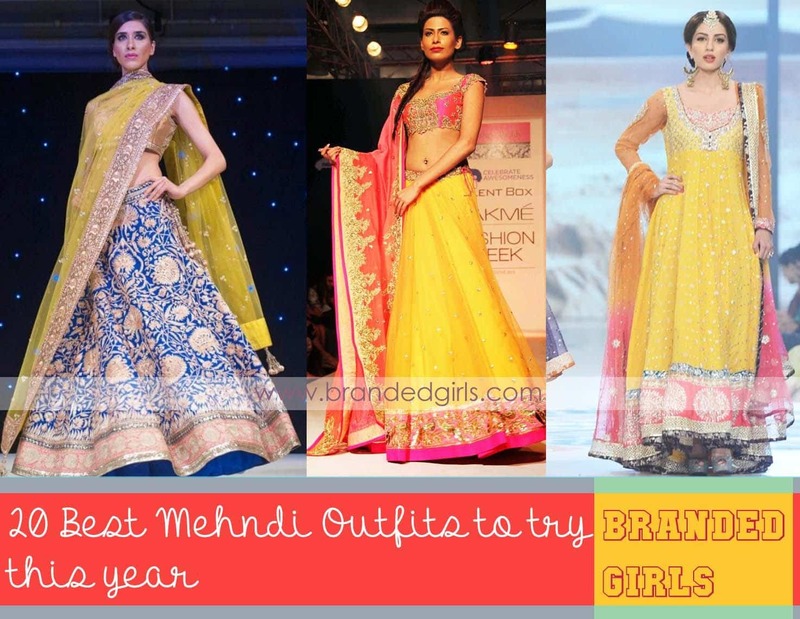 These cheery outfits reflect the traditional enthusiasm and subcontinent culture. 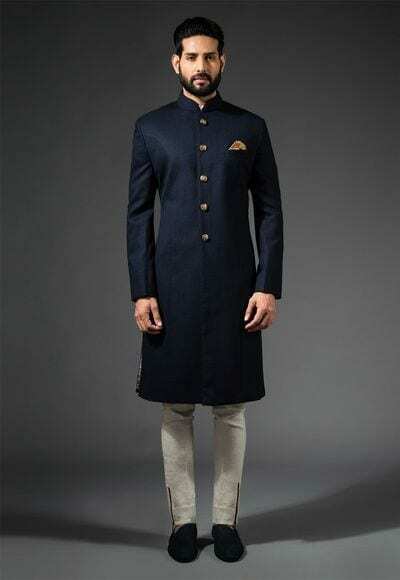 Sherwani is the basic attire of baraat day but guys can add different variations to the traditional style and color according to their own choices. 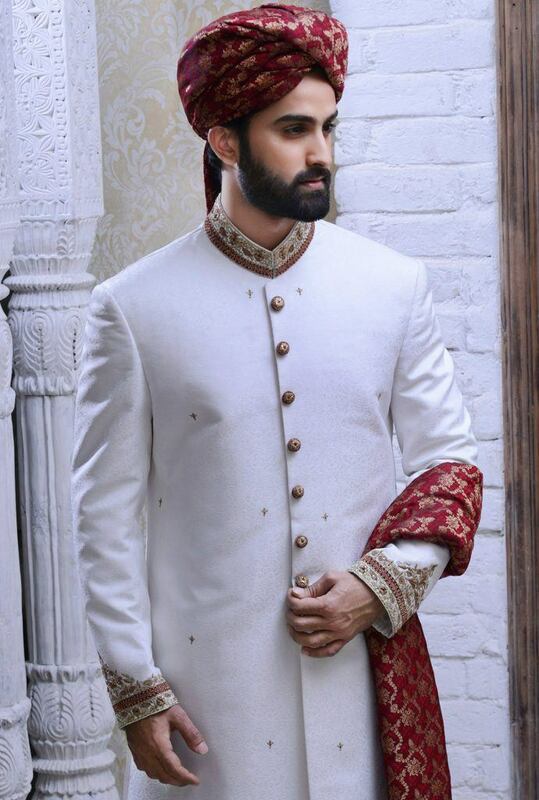 Grooms can wear Sherwani with various styles of pants or shalwar to have the unique look. 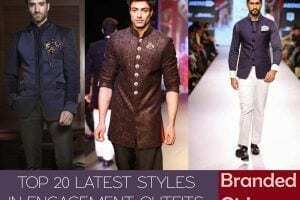 Today, guys can just go through the collections by different designers and find some amazing Sherwani outfits for themselves. 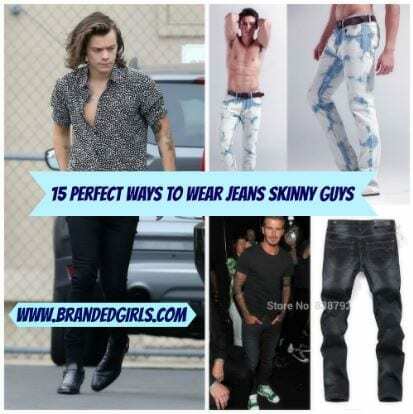 The various fashion shows held in various urban cities reflect the enthusiastic work by designers and the trendy sherwani designs that will take your breath away. The article will cover the best designs of sherwani dresses by different Indo-Pak designers and will provide you with some amazing ideas to accessorize your sherwani outfits in a trendy manner. The very traditional Indian style sherwani in a darker shade of blue color looks quite stylish as well as humble at the same time. This is simple sherwani can be accessorized with a graceful handkerchief in the pocket in an alternative color as well as some royal button. 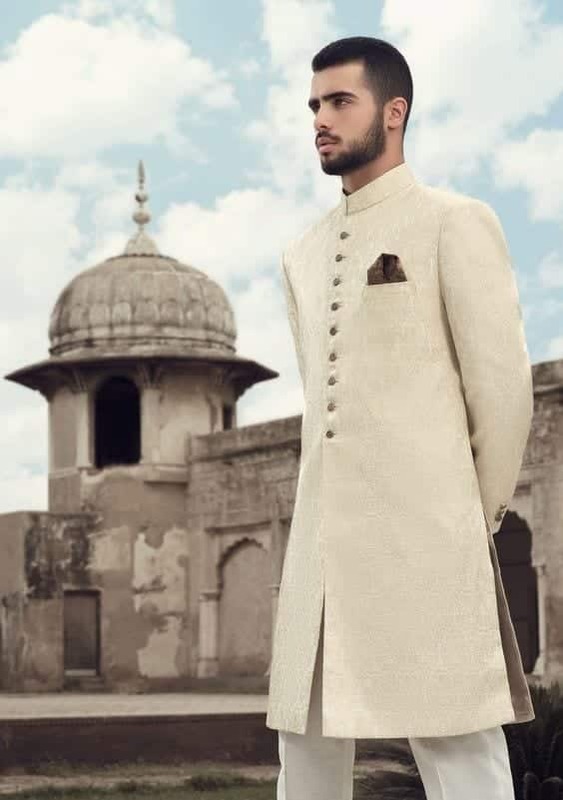 Pair up this style of sherwani with off-white pants or pure white shalwar to spice up the attire. To try something different, you can also have a look at these Ankara Styles for Wedding. 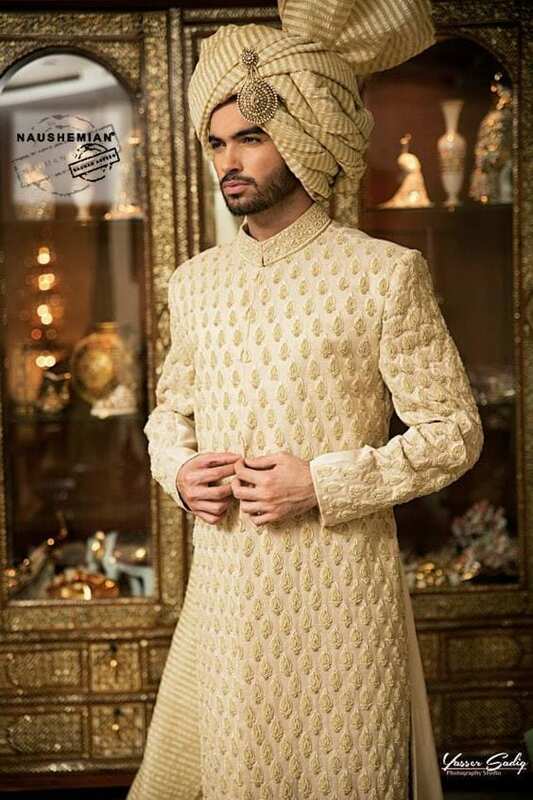 This charming beige sherwani in jamawar is designed by one of the renown designers of Pakistan, Amir Adnan. 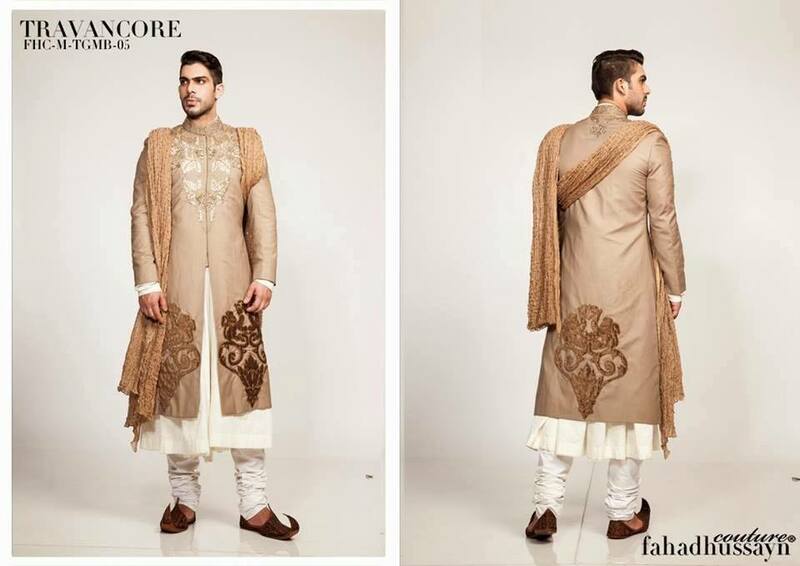 This knee-length sherwani gives a light gold look which creates a slight luxurious look. The left side pocket of the sherwani is accessorized with a trendy brown handkerchief. 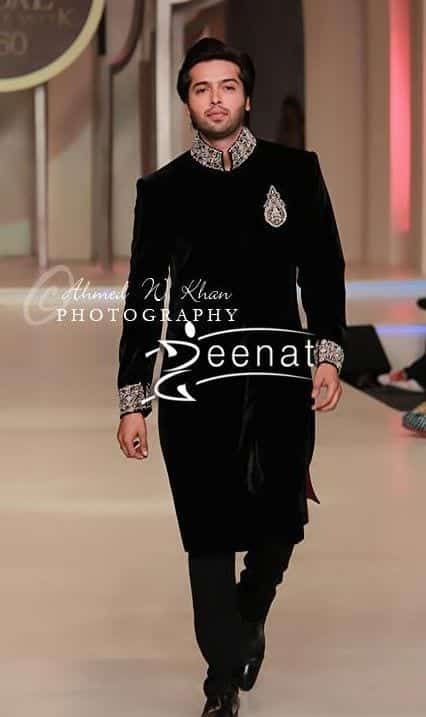 This style of sherwani is usually worn with a churidar or shalwar which enhances its cultural look. Floral embroidered sherwani by Sabyasachi Mukherjee got ultimate fame due to the unique and fashionable styles of sherwani designed in a more traditional manner. This amazing sherwani style was matched with the bride’s lehenga and created a very royal overall look. This style of sherwani worn with churidar and turban is an ultimate choice for any groom on his special day. 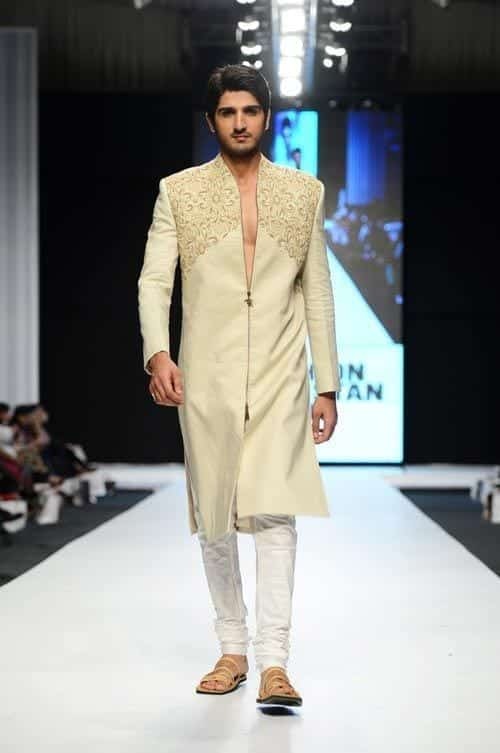 Deepak Perwani’s off-white sherwani with deep and unique neckline and embroidered shoulders looks really dope. This amazing style which can be considered semi-formal can be worn on mehndi event as well. White churidar and gold khussa or sandals will look equally amazing with this style. 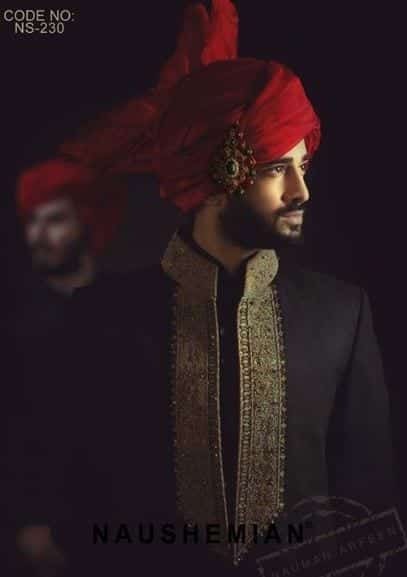 Nauman Afreen’s classic piece with precise thread work at the neckline and red turban blended with black beautiful sherwani is the ultimate option for any groom on his baraat day. A brooch on the turban will spice up the entire look. 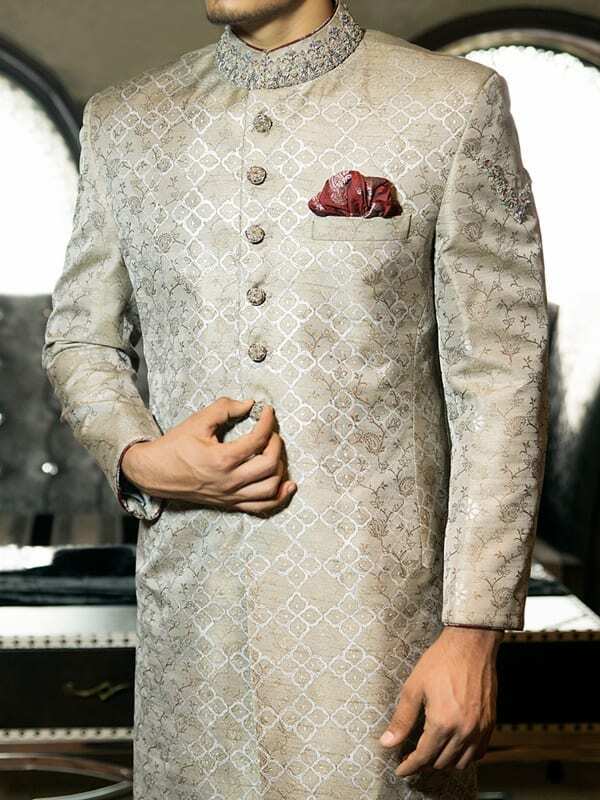 This style of sherwani can be worn with simple mucation or derby shoes. HSY (Hassan Shahryar Yasin) has been known internationally for designing elegant sherwani outfits. His collection is not limited to Pakistan only rather it is also presented in India, Turkey, and America. 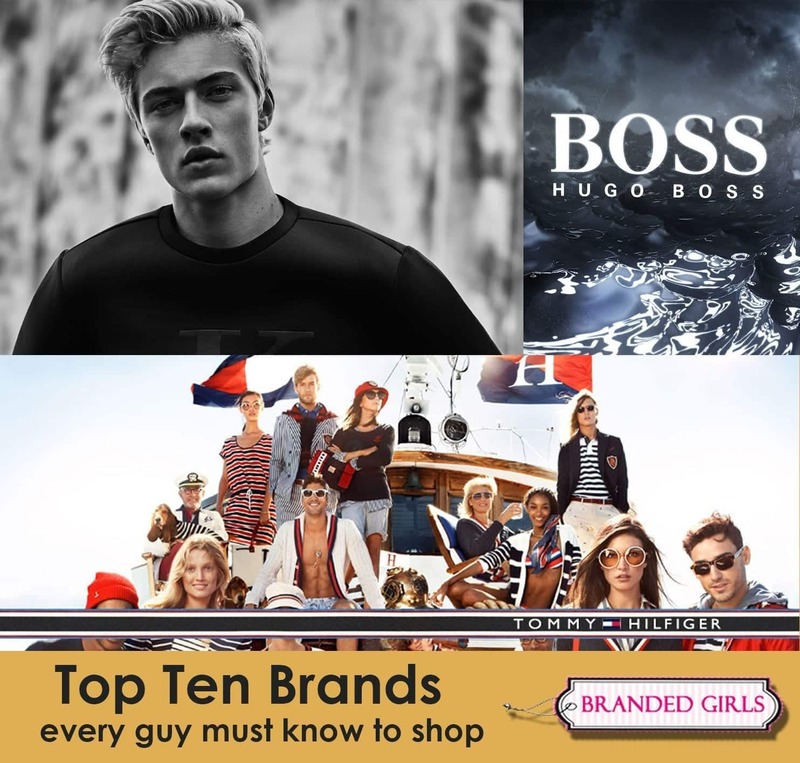 The designer has got massive success at a rapid pace. HSY is known for the exceptional needlework and unique styles. The amazing sherwani with black base and gold needlework is exquisite. 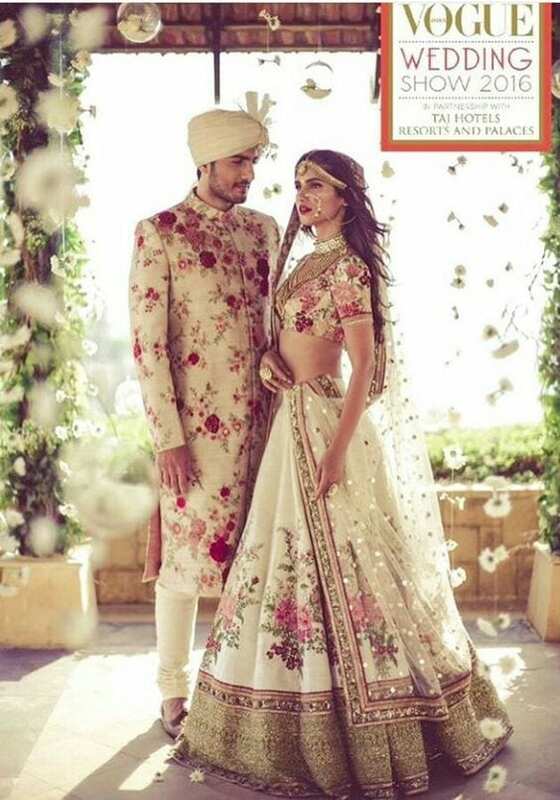 You can also find some great inspiration from these Engagement Outfits for Indian Men. Amri Adnan’s exquisite sherwani with maroon needlework and maroon turban is just perfect for the wedding day. The precise and elegant needlework on the neckline and sleeves enhances the overall appearance. Pure maroon sherwani is the hype of the season. 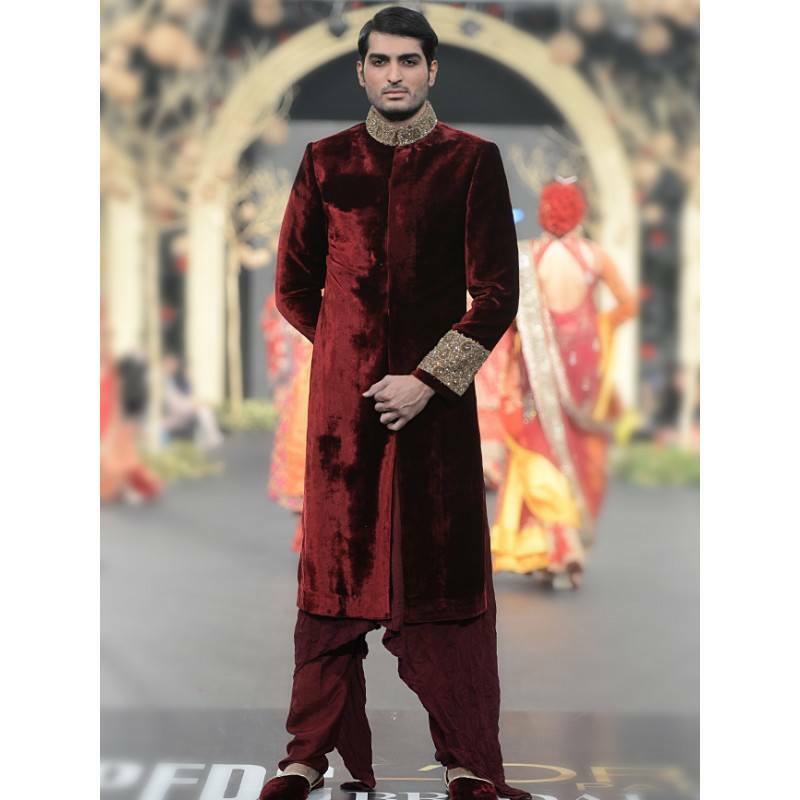 The velvety luxurious sherwani with elegant gold needlework on neckline and sleeves is designed by HSY. 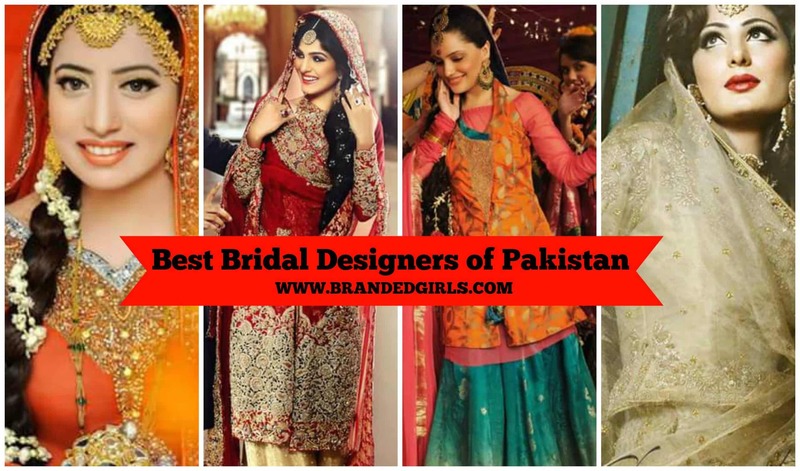 If you wish to go for a designer sherwani then do choose from one of these Top 5 Bridal Designers of Pakistan, since they are the best in Pakistani Fashion Industry. Orange is rarely worn by grooms on their wedding day. 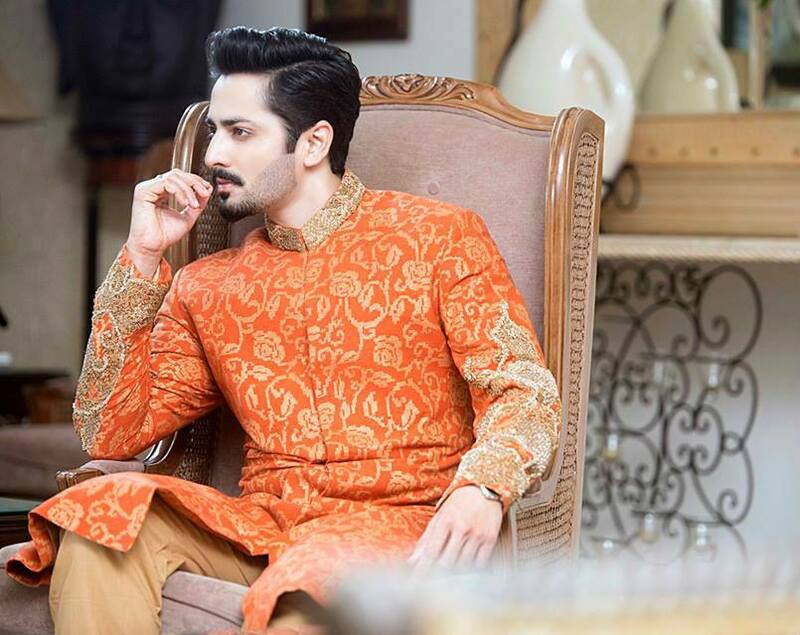 However, HSY has designed this ravishing orange and gold sherwani which can be worn on the wedding day as well as mehndi. 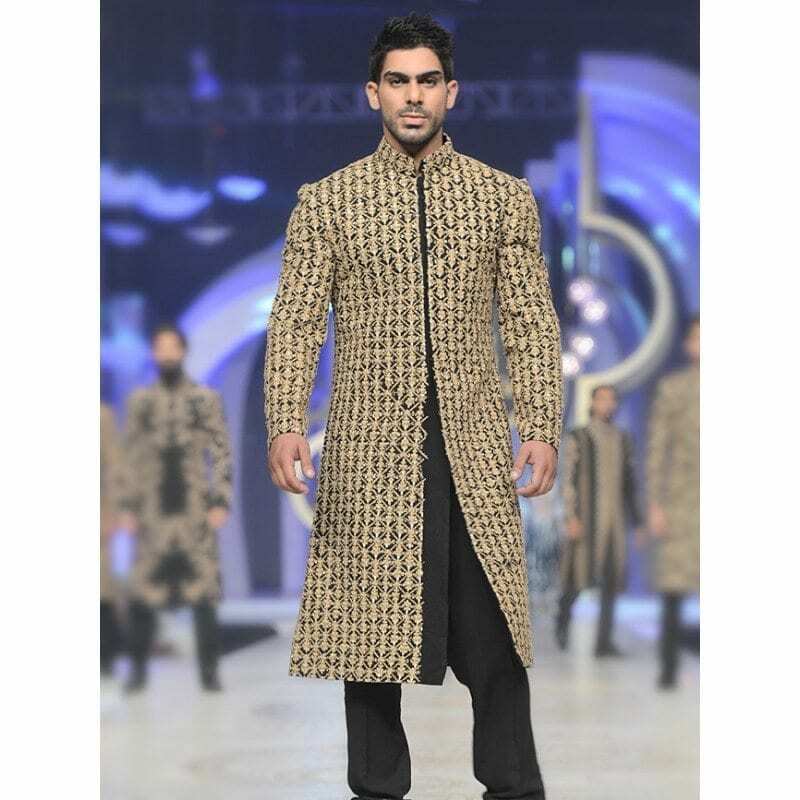 The jamawar sherwani can be worn with skin pants and khussa to spice up the entire look. Deepak Perwani’s amazing plum sherwani in velvet with simple golden needlework on the neckline and sleeves is the epitome of perfection. The brooch on the pocket is definitely an add on. Plum is a unique color and looks very fresh and chic on the wedding day. This amazing silvery gray sherwani with epic silver work on the neckline and shoulders is designed by the well-known brand Junaid Jamshed. The fancy buttons on the upper part of the sherwani look extremely stylish and enhance the overall look of the sherwani. 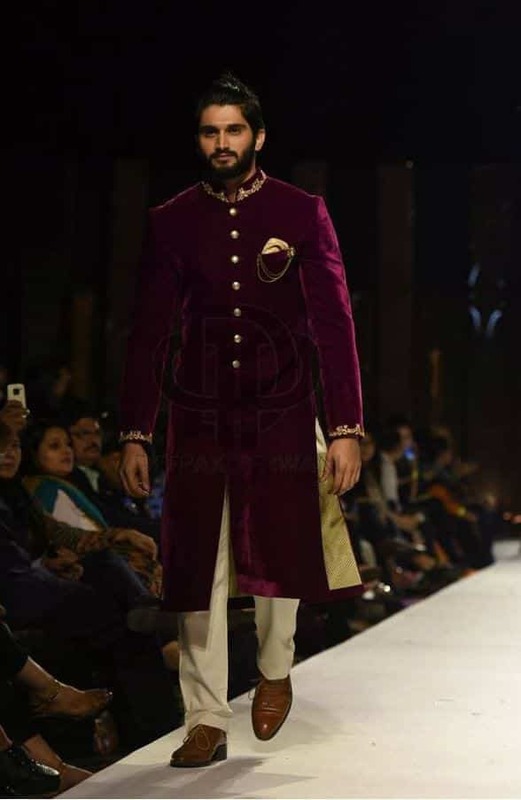 Fahad Hussayn’s formal sherwani style is extremely ravishing. Worn with chunri dupatta, it can create an exceptional look. 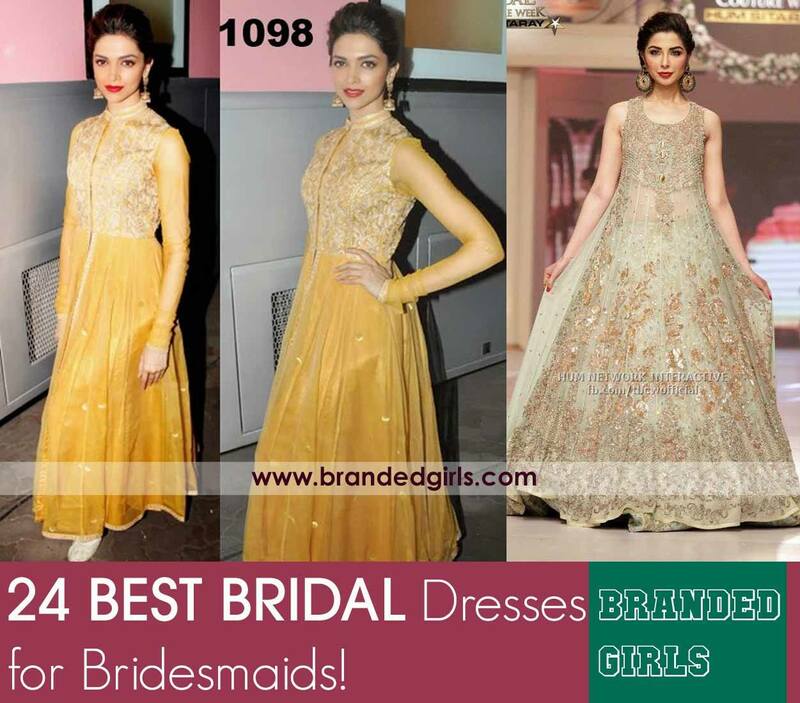 The dull gold work on the neckline and embroidered motifs on the back and front bottoms is exquisite. If you’re looking for another option to wear on one of the wedding days then how about these Latest Kurta Styles for Men. 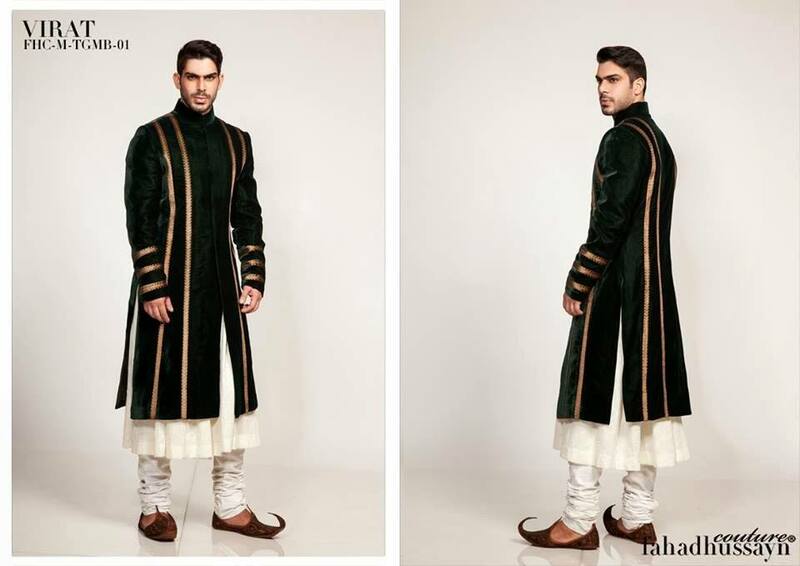 This green silk sherwani by Fahad Hussayn is both simple and attractive. It can be paired with churidar and traditional khussas to create an ethnic look. The simple yet fashionable look is just perfect. 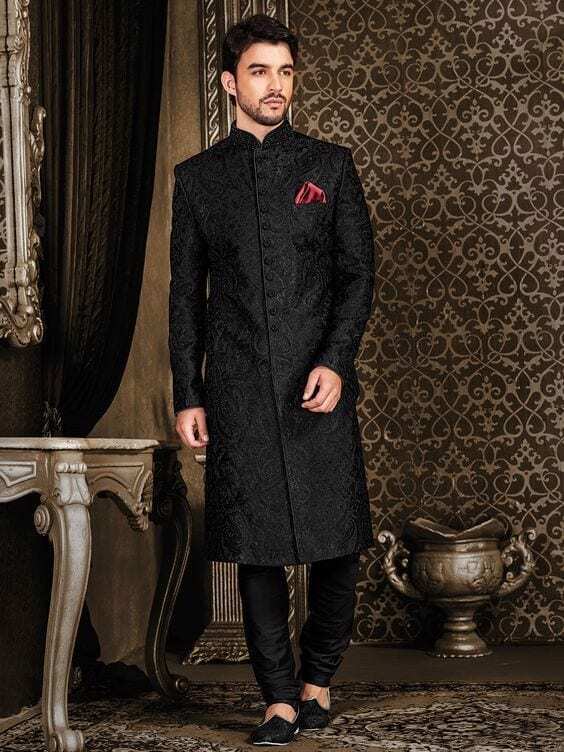 Terry Rayon’s embroidered jet black sherwani is just perfect for the big day of any groom. Worn with a maroon or black khussa, this style will give you a smart and slim look and it can go with any skin tone. The festive short sherwani in multi shades with a patiala shalwar looks amazing on skinny and tall guys. 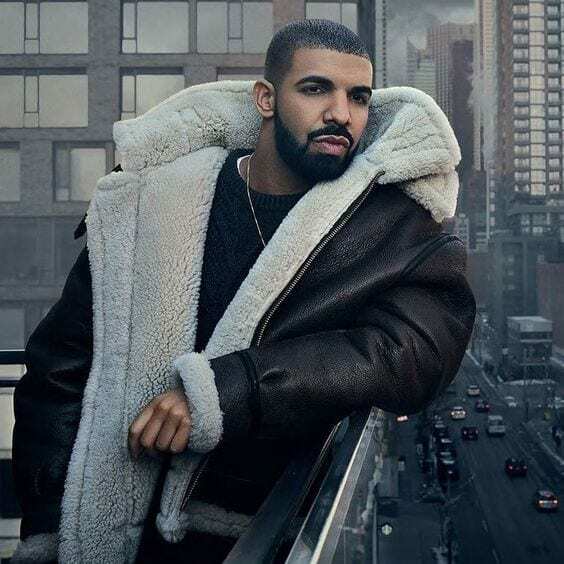 This style is both unique and trendy. Zainab Chottani’s fitted black sherwani with amazing stone work on the neckline and sleeves along with a simple gold motif is just epic for the wedding day. 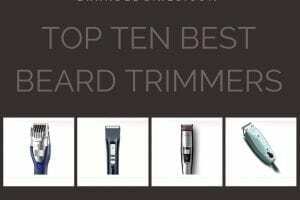 It can be worn with black mucation as well as a gold khussa complementing the work. Jodhpuri sherwani style is quite popular in India. These short sherwanis in various bright colors look really festive on the mehndi day or any other wedding function. These are usually worn with Patiala shalwar. Shantanu and Nikhil’s sherwani in pastel shades will take your breath away. 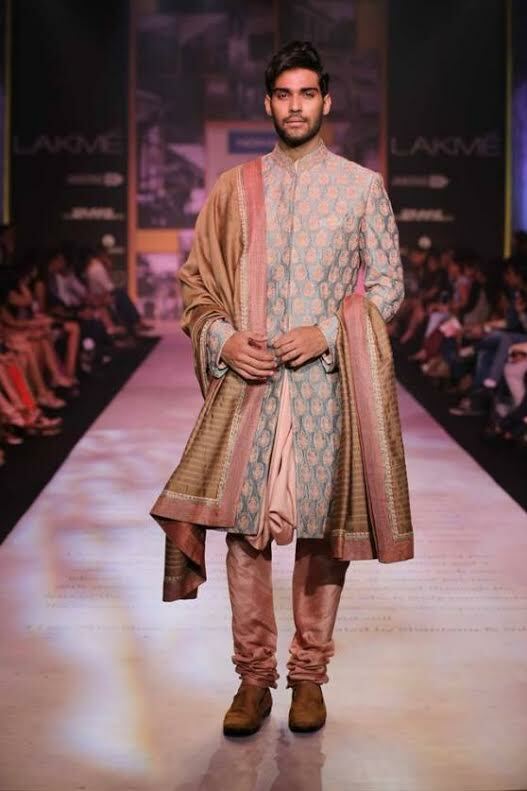 This sherwani in peach pink shade and jamawar material is an epitome of perfection. Sherwanis in pastel shades give a very soft and unique look to the groom. 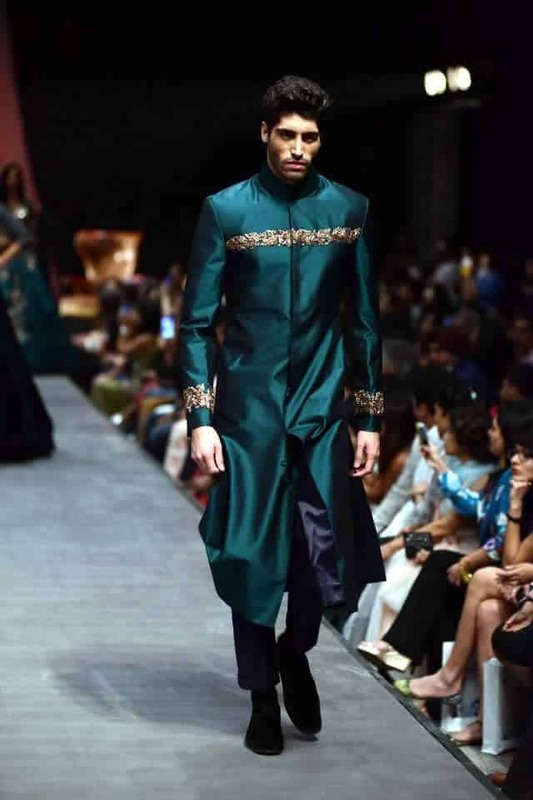 Manish Malhotra’s turquoise green sherwani in long length will make any tall guy look ravishing on his wedding day. This sherwani in silk material is embellished with precise thread work on the sleeves. Turquoise is a cool color and it will go pretty fine with any skin tone. Give your feedback through the comments section if you liked any of these sherwani styles.